When it comes to alternative fuels, diesel seems to be leading the way. While hybrid technology is definitely putting a chink in the armor of diesel sales, many people still feel more comfortable with the added dependability and fuel economy of a clean-diesel engine. Diesels also have a reputation for possessing much more low-end power. This comes in especially handy for people who need to tow or haul large objects, which is why an SUV is a perfect match for a tough-as-nails diesel engine. Finding the right one, however, can be a chore; there aren’t too many left available. That’s why we’ve taken research from Car and Driver, Consumer Reports, Edmunds, and Motor Trend to find you the best diesel SUVs of 2011. You will have 450 lb-ft. of torque coming from the 3.0L-inline-6 turbodiesel engine if you choose the xDrive35d. 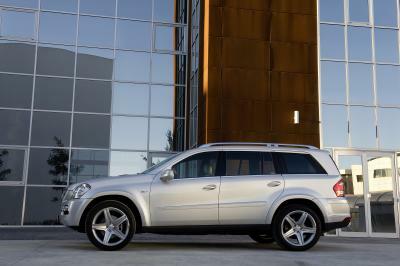 That’s also good for 19/26 mpg (city/highway), and a maximum towing capacity of 6,000 pounds. Even though this is a three-row SUV, most will want to skip the third-row seat altogether, unless you have children small enough to fit into it. With both rear seats folded the Beamer has a maximum cargo capacity of 75 cubic feet. Don’t think because you’re getting all that space and power that you’ll be deprived of a luxurious ride, responsive handling, or a premium list of amenities either, because this BMW has them all. The three-row monster GL350 is your best choice if you’ve got a big family and crave a diesel SUV. The third-row seat is roomy enough for two full-grown adults or any size children, and the ample second-row is missing only a fore/aft adjustment. The 3.0L turbocharged V6 and seven-speed automatic transmission are combining to churn 210 horses and 400 lb-ft. of torque, and get an estimated 17/23 mpg fuel economy. Cargo capacity can increase to a maximum 83 cubic feet, but it’ll be hard for passengers to give up all that luxurious space just to make room for a flat-screen television or a new curio cabinet. Another 3.0L turbodiesel six-cylinder, estimated at 17/25 mpg and coupled with an eight-speed automatic transmission and all-wheel drive, is powering our best luxury option; but, as you’ve probably guessed, that’s not the reason it was chosen as our best luxury option. For as long as the four-ring emblem has been around, Audi has been synonymous with luxury automobiles; the Q7 is no exception. 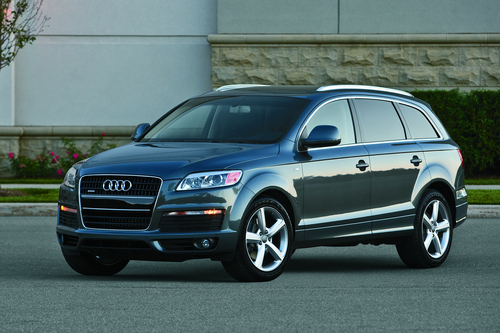 “Like all Audis, the Q7 ranks high when it comes to its interior. The dash layout is driver-oriented, and Audi’s MMI is relatively easy to use once you’ve had some practice.” (www.edmunds.com) The optional Towing and Cold Weather packages are perfect for people who like to take skiing, snowboarding, or snowmobiling trips. 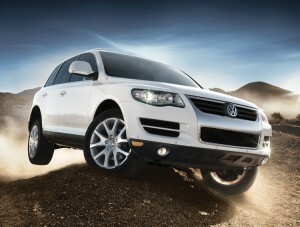 The Touareg is debuting for the 2011 model year in its second generation. This is the biggest redesign it has sustained since its inception in 2002. One of the biggest changes is the dual-range transfer case becoming optional equipment instead of coming standard. This will knock between 400 and 450 pounds off the total weight of the vehicle. This will improve an already-capable handling and suspension. It still only seats five, but rear legroom has been improved and the addition of three-position adjustable backrests to the second row enhances the ride for rear passengers. In early test drive results, it looks as though this one could actually tear a trail through competitors in this class.